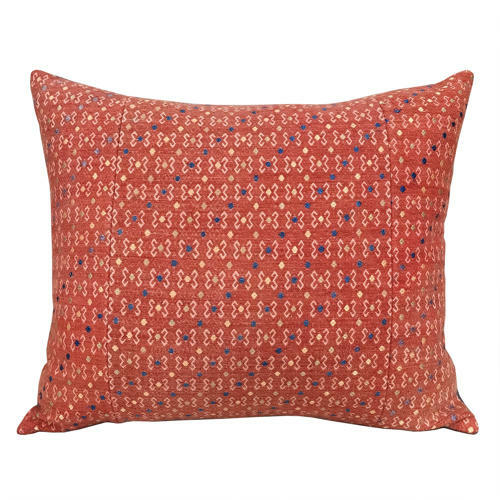 These large cushions are made from a vintage Zhuang wedding blanket in cotton and silk. The main colour is a mineral dye, probably senna, which has faded over time giving a beautiful patina to the textile. There are silk diamonds woven in supplementary weft, in blue, yellow and green silk. Now lovely muted colours. I am unable to find affordable blankets of this quality now so these cushions are rare. They have been backed with another vintage minority textle, which is a Buyi handlooom, in indigo with a small zig zag pattern. Exquisite! There are zip fasteners and feather pads.